Research on Cryptosporidium parvum scours in New Zealand. To better understand the relative importance and to assess risk factors to manage, we need to have more information on the disease and how it is transferred. Can New Zealand contribute to cryptosporidiosis understanding and at the same time develop management protocols to reduce the risk of disease? Epidemiology: Understanding the climate and management factors affecting between-cow spread of genotypic subtypes of Cryptosporidium parvum has to be one of the high priorities for research. Genotypic sub-type strain identification: Epidemiology will advance significantly with the information provided with genotype sub-typing by providing a technique to follow infections of selected genotypic subtypes in a population of cows (or calves). Recent research has indicated that different genotypic subtypes traverse closed (cows) herds during any one year. Not all genotypes are equivalent in severity of signs (Thomson 2016). 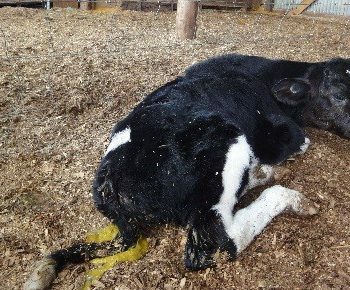 Early research (Thomson 2016) suggests that the period of excretion of oocysts from one cow may be limited but may be critical with respect to the development of subsequent cryptosporidial calf scours. 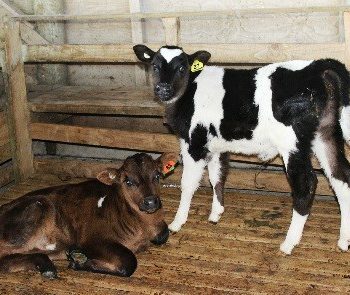 New Zealand in Focus: If cow-to-calf transference is as important as research suggests (Thomson 2016), understanding the factors of between-cow (particularly dry cows overwintered) under New Zealand conditions is critical to formulate advice to lower the risk of cryptosporidiosis in calves. This is potentially an important feature for New Zealand management where cows are overwintered outside on limited pasture with access to supplementary feed. These cows may have a significant burden of dung on many areas of their bodies including the udder before calving. In Scotland Thomson (2016) has emphasised that only one (early calving) cow was responsible for the calf cryptosporidial infections. In Scotland Moredun disinfection advice (Innes & Wright 2008) targets cleaning of cows before calving in an effort to reduce risk of transference (of oocysts) to calves. No data is presented as to whether this is effective under any circumstances. And in New Zealand we have no data available to show just how our different conditions affect this aspect of risk management for cryptosporidial disease in calves. Nor how climate and drainage may be interacting with risk. Reports from the UK in 2006 an analysis over several years of risk to humans shows that the prevalence of cryptosporidial human cases of infection is higher if the previous weather is warm and relatively dry. Approximately 50% of human cases studied were of Cryptosporidium parvum origin (Nichols et al 2006). Warm dry weather is considered to be associated with times of high soil moisture deficit when any Cryptosporidium falling onto the land with likely build up (of oocysts) and not be transferred to water courses. Could winter pasture feeding out be affecting between-cow risks of spread of Cryptosporidium genotypic strains? Effluent management. Is it providing a safe period for composting/heat disinfection and inactivation of oocysts? Are there management practices that need to be avoided if effluent is to be safe for control of Cryptosporidium? Sub-typing Cryptosporidium oocysts has generated much new information and has the potential to provide new insights into the transmission of disease. Research needs to be undertaken to improve the methods for genetic sub-typing of material extracted from faeces that could be used on all samples. Although research is currently underway into the investigation of C. hominis subtypes using a variety of typing methods, further studies of the population genetics of C. hominis are required to allow greater differentiation between isolates. Sub-typing methods for C. parvum and C. hominis should be subjected to systematic evaluation in an inter-laboratory trial. The ways in which sub-typing might be useful in further elucidating the epidemiology of cryptosporidiosis need to be examined. The same priorities exist in New Zealand for the future welfare of calf rearing and dry-cow management. Nichols G, R Chalmers, I Lake, W Sopwith, M Regan, P Hunter, P Grenfell, F Harrison, C Lane. (2006)Cryptosporidiosis: A report on the surveillance and epidemiology of Cryptosporidium infection in England and Wales. Drinking Water Directorate Contract Number DWI 70/2/201.